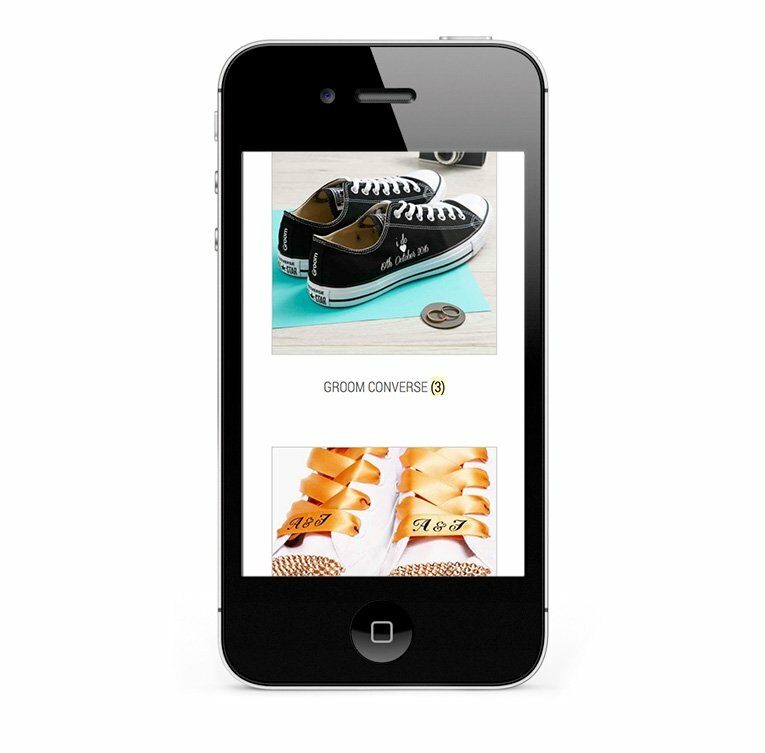 This is an eCommerce website design for a footwear store built on WordPress with WooCommerce. Saf Mahoune has been working in the garment decoration business for over 12 years and started customising shoes about 4 years ago. 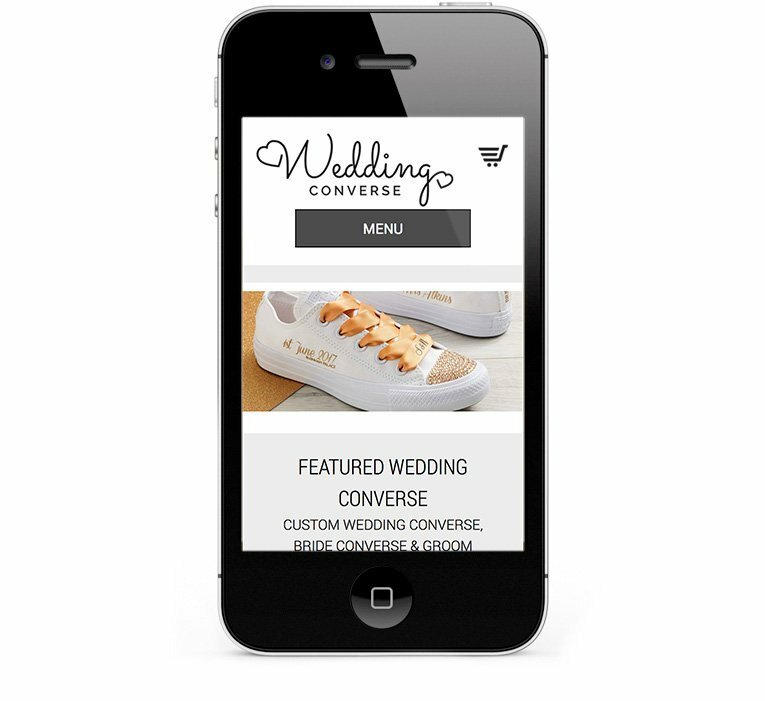 He has developed a unique system that enables him to customise Converse, Vans, Nike and Adidas trainers…Whether you want to twirl up the aisle in style, dance the night away in comfort or show your new Mr and Mrs status on honeymoon, our custom Converse are the perfect choice. We specialise in hand customised Converse, for the Bride, Groom, Bridesmaid, Maid of Honour, Pageboys….in fact the entire wedding party. 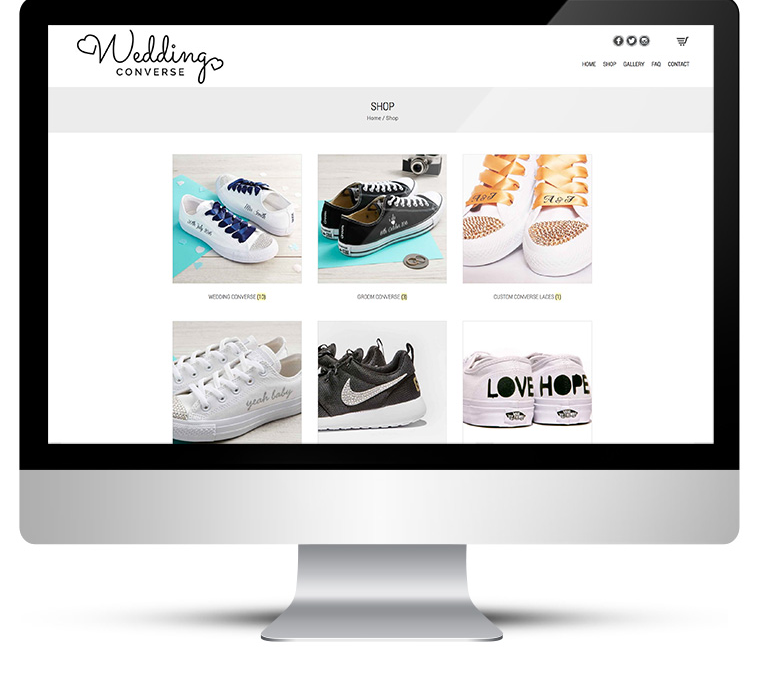 The aim of this new WordPress website is to enable customers to review the portfolio and to place an online order for the shoes and the customisation. The site needed to be a showcase and an online store. The eCommerce website design must be graphically strong and the theme is black and white simplicity. The website must look good on all devices. 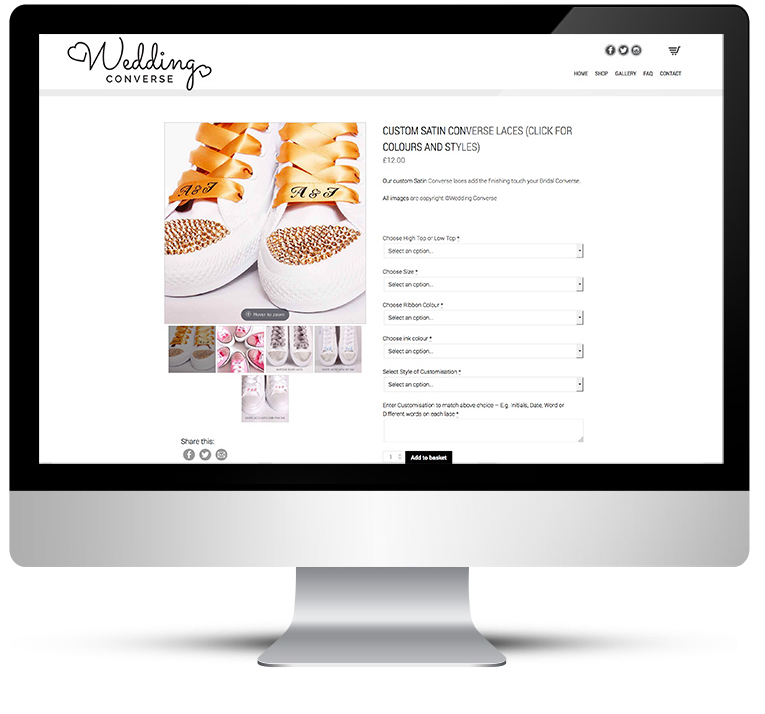 My brief was to build an online store that was Clean, Contemporary, Simplistic and Black and White! So that is exactly what I did. 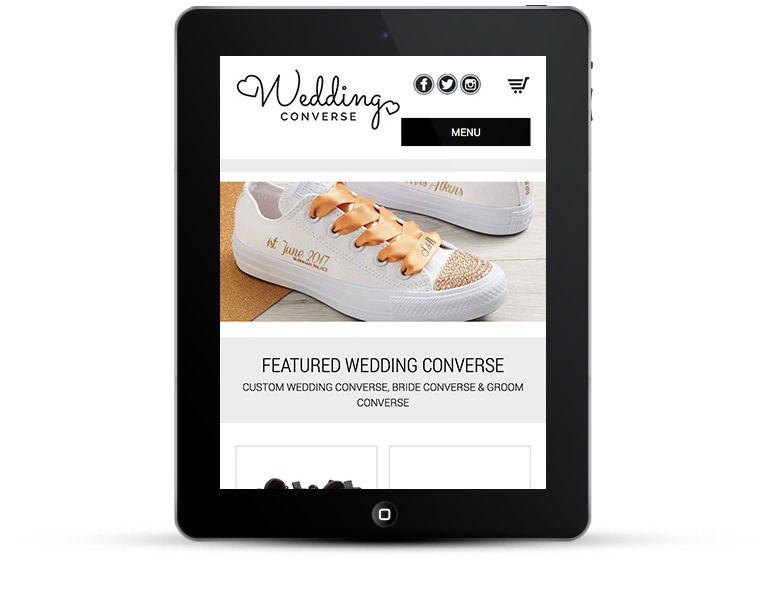 Wedding Converse had their own logo and this needed to be incorporated into the web design. I also included it in the site footer as a subtle background to keep the theme going. I created customised social media buttons and other graphics to match. Big bold images showcase the product. Modern fonts and buttons and icons compliment the style. The website is visitor friendly with product image zoom and product customisation options for buyers, making it very easy for visitors to buy online. 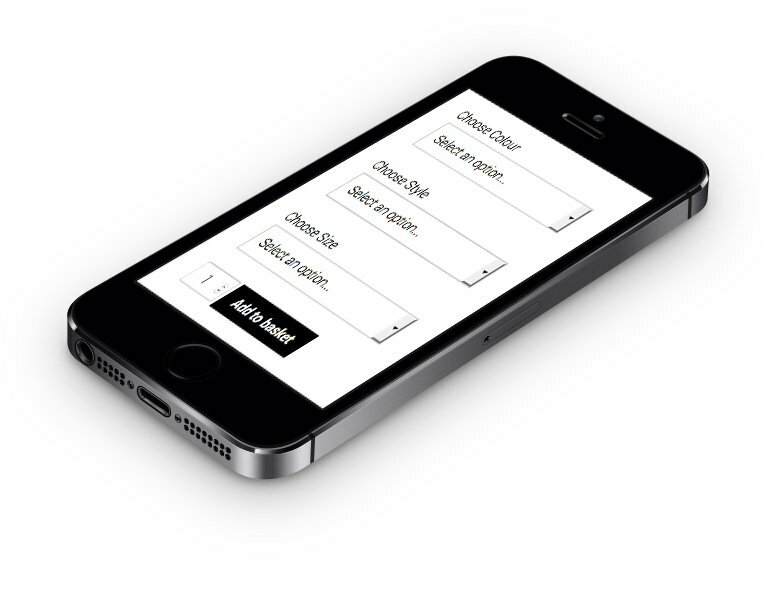 Mobile responsive website, looking great on all devices from desktop to the smallest mobile. It goes without saying that the site is Google friendly and being built on the WordPress platform it is incredibly easy to use. Instagram integration with a feed on the home page. I loved this project and very much enjoyed working with Saf and Sarah.